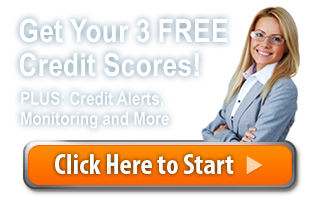 Get Your FREE 3 Credit Scores! Starting Your FreeScoresAndMore Trial is as Easy as 1-2-3! Important Information: Begin your membership in FreeScoresAndMore for 14 days and check your scores for free. If you don't cancel within the 14-day trial period, you will be billed $19.99 per month until you cancel your membership. Click on "Click Here to Start." Fill out the simple form. Confirm your identity & see your scores. FreeScoresAndMore helps protect you with the Power of 3! See all 3 scores today free - Experian, Equifax, and TransUnion. Your CreditXpert® Scores™ are provided by CreditXpert Inc. Although these scores are not used by lenders to evaluate your credit, they are intended to reflect common credit scoring practices and are designed to help you understand your credit. Help protect your credit and personal information with daily credit monitoring1 of your files at the three major credit reporting bureaus - Experian, TransUnion and Equifax. Plus, receive quick alerts by text, email or phone when certain changes occur in your credit files. Changes you may not be aware of, that can indicate potential credit or identity fraud. Identity Verification Monitoring works in real-time to help prevent your personal data from being used for fraudulent activities that may result in identity theft, account takeovers, or account compromises. In the event your identity becomes compromised, you can count on the support and guidance of our experienced fraud recovery experts to help you resolve key issues. Start your FREE Trial and get all this! Enables you to see at a glance how making certain changes to your credit practices could impact your credit scores and your overall credit picture. Checking Your Credit Rating With FreeScoresAndMore Will NOT Lower Your Credit Scores! Begin your FREE trial with FreeScoresAndMore. If you don't cancel within the 14-day trial period, you will be billed $19.99 per month until you cancel your membership. Your credit scores1, as developed by CreditXpert, Inc, are designed to help you understand your credit. Although different from the scores lender use, they use the same credit bureau data and are intended to reflect common credit scoring practices. Have more peace of mind and less stress with our vigilant monitoring. Checking your credit information will NOT lower your credit scores!